Despite the distorted image of Islam in the West, there remains an underlying sense of admiration and intrigue surrounding the exercise of the Islamic faith. This fascination with the world’s fastest growing religion is one that goes beyond the old school infatuation with the exotic other, but rather a slightly more sincere attempt by outsiders to approach Islam as a guidepost for better understanding where to revive their own faith traditions. 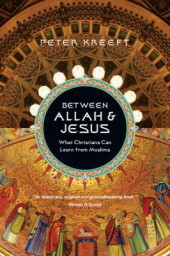 In Between Allah and Jesus , Peter Kreeft attempts to demonstrate through character dialogues how the Islamic faith has remained grounded and steadfast in their conviction comparison to the exercise of Christianity in the West. Kreeft uses four central characters, Isa, a well-versed Muslim student who serves as the leading character and sole representative of the Islamic faith; Libby, a liberal Christian who seems at times less convinced of the validity of Christian teachings than Isa; Evan, a conservative Christian house-mate, Father Hareema, Isa’s theologically well-rounded Jesuit professor; and Father Fesser, a liberal priest with a worldview that seems lacking in depth of conviction given his status. This group of individuals grapples with a range of sixteen major topics ranging from the approach of each faith on the relation between morality and theology to sexual morality and moral ambiguity. In order to demonstrate the strength of the Islamic outlook on each of these topics, Kreeft uses one character, Isa, to provide insight into the Islamic framework for understanding each. In each conversation, Kreeft intentionally layers the Muslim character with arguments that are both logically sound and theologically supported. He says to have done this in order to create the ideal Muslim in Isa. In doing so, he also chooses to make the other characters appear as less than ideal representatives of their Christian faith. Although Kreeft could have used multiple Muslim characters to make his point, he chose Isa as what he feels to be representative of the ideological core of Muslims. “It’s(book) point is not to convince its reader of a character- but of a character trait I find hard to define but easy to show in Isa. It is a character trait that I find more obvious in Muslims (and in Jews too) than in Christians.” By contrasting the Islamic character Isa with the other Christian characters, Kreeft builds the scenario in which the reader begins to sense what’s missing – simplicity. Although Kreeft does not directly state what this simplicity is, he lays the groundwork for the reader to recognize it on his own. In his introduction to the text, he states that Christians should learn from Muslims, or be reminded of by Muslims the following: Faithfulness in prayer, fasting, and almsgiving; The sacredness of the family and children and hospitality; The absoluteness of moral laws and of the demand to be just and charitable; The absoluteness of God and the need for absolute submission, surrender, and obedience (“islam”)to Him. The “spiritual toughness” and “strength of will” that Kreeft wishes to convey through his Muslim character dances around this aspect because it is the sole topic that Kreeft required the reader not to breech- Unitarianism. He cannot put his finger on what creates this rootedness because he never allows his Muslim character to directly address this issue. While these are the stated recommendations of Kreeft to his intended Christian audience, what he communicates through the crafting of the character dialogue is more subtle. Throughout the book we here and how Isa takes his Christian counterparts through exercises of logic in the understanding of both Islamic and Christian doctrine. Most often, what he shows is that Muslims and Christians are both in search of submission to God, yet follow different logic. The Christian points of logic appear more bruised and fractured not only through what Isa perceives as his friends multiple Christian outlooks but also because much of the Christian outlook is being shaped by the West rather than vice versa. These breaks in logic on the core principles of faith and divine guidance is what Kreeft reveals through the less grounded Christian characters. Kreeft demonstrates how Muslims in general instill the concept of submission in the application of faith in modern times. This purpose of faith has remained the same. Submission to Allah (swt) remains the filter for understanding current circumstances rather than current circumstances becoming the filter for understanding Islam. This prevents the Muslim from engaging in back reaching logic that interferes with a Believer’s ability to fully submit to God’s will. Despite the very engaging arguments between the characters, it’s the ability of Muslims to look back to Islamic teachings that has enabled it to remain rooted. However, Kreeft overlooks how the Muslim “strength of conviction” is truly born out. Kreeft fails to address the role of theology in this rootedness. This “strength of conviction” that he admires amongst Muslims is not by sheer coincidence or based merely upon the reliance upon laws and ritualism. The source of this rootedness lies upon Tawheed- belief in the oneness of God. The various arguments that are undertaken by the characters can be interpreted and applied in any number of ways. Isa’s responses, though logical and well thought out, can be quite different from one Muslim to the next. Kreeft already demonstrates this with his Christian characters, but limits the reader’s ability to apply alternative Islamic views beyond the perspective of Isa. It’s unclear why the Islamic viewpoint is only presented in one character. However, an over analysis of the other three main characters appear to coincide with each nature of the Trinity. If Christians see themselves as a part of the monotheistic tradition, the emphasis on the Oneness of God or a greater study and reflection on the role of God the Father (in Christianity) should be pursued. Father Hareema’s more unified orientation of God acknowledges Islam as upholding the tradition of God in a way that connects its core objectives. He views Islam as a partner against evil and in submission to a common God. Father Hareema does not disregard Jesus but understands Jesus’ grace as a potential for the Muslim who has at least sought to know the Father. Evan, has a greater difficulty moving beyond recognition of Islam as an equal partner. Jesus forms the basis of his gatekeeper-style Christianity. Jesus only has grace for the Christian with access denied for all others. On the other hand, it’s not so obvious what Libby believes. Her belief is characterized by the spirit of the moment. She positions herself between a belief that good God-conscious people will go to Heaven and the need to maintain a regulatory role for Jesus. Almost unwittingly, Kreeft creates the intellectual environment for the reader to question the role of theology in the exercise in instilling a sense of conviction. If “Islam crucially lacks the Cross, and Christ, and his radical love,” as Kreeft puts it, where do Muslims get this sense of conviction? Kreeft’s characters have already established Islam as being good at its core so what is it? It’s the theological difference that the reader is left to battle with. Why does Isa have so much conviction if the dialogues reveal more commonality between the two faiths? The reader is left to grapple with the one glaring difference between Islam and Christianity: the Trinity. It’s not obvious if what Kreeft leaves with the reader is intentional or not. After all things are considered, Kreeft leads the reader back to the one thing that he very intentionally took off the table in his introduction- Unitarianism ( the theology that insists that the one God is only one Person, not three, and that Christ is only human, not divine). Kreeft neglects to address that much of what has interfered with the sense of rootedness in Christian societies also has something to do with the lack of rootedness in the theology itself. He indirectly compels the reader to acknowledge that the strength of conviction does not proceed from any of the logic-based dialogues that have taken place. The dialogue merely points back to the Oneness of God. Rather than crossing the line of acknowledging the role of Tauheed in the strength of conviction amongst Muslims, Kreeft could have acknowledged the concept of monotheism in Christianity. There are ample ways that that the exploration of God as One can be addressed as a necessary means of maintaining a sense of unified Christian conviction. Isa’s character was not just a demonstration of the Muslim strength of conviction, but also a display of how the doctrine of the Trinity has affected . If Christians see themselves as a part of the monotheistic tradition, the emphasis on the Oneness of God or a greater study and reflection on the role of God the Father (in Christianity) should be pursued. Father Hareema’s character laid out the Christian option that appears most viable in getting back to the rootedness of Christian conviction without getting outside Christianity. Father Hareema recognizes that there is much opportunity that needs to be taken by Christians to acknowledge God as One. What exists between Allah (swt) and Jesus (pbuh) in both Islam and Christianity is submission. There’s no getting away from acknowledging this. What Christians can learn from Muslims is the model of Jesus’ (pbuh) submission to God-the root of conviction. Please type '328' into this field.